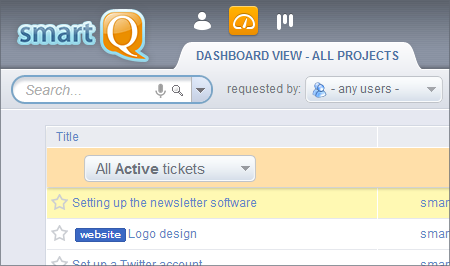 We just added the Dashboard View – it lets you see tickets across all the projects in one list. No more switching between projects to check for the new tickets or new notes posted into different projects. The new screen is accessible through the switch on the top, by the People and Project buttons. Next post: smartQ is now available on iPhone!!! Previous post: Customer Story: TravelClick Inc.